Aging: by a tea collector in a jar. 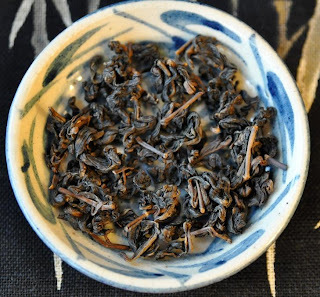 Except for its original medium charcoal roast in 1980, this tea hasn't been roasted again. 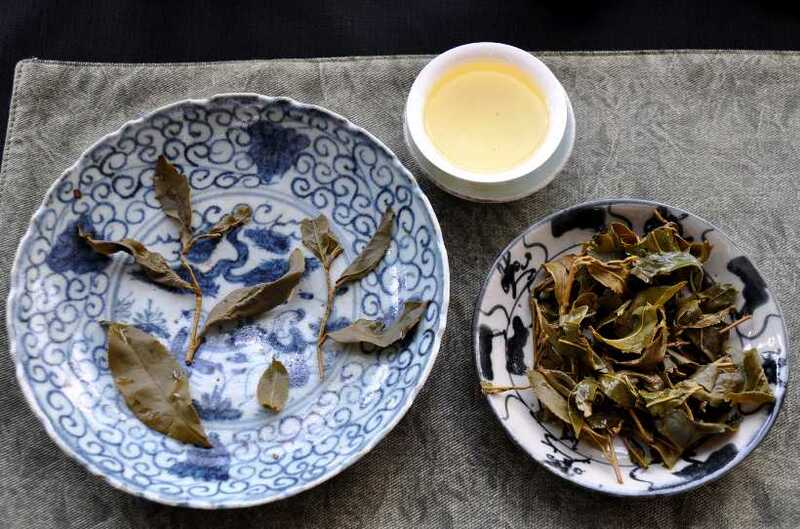 The dry leaves are typical for real aged Oolong: they are not as tightly rolled anymore. With time, the leaves tend to open up a little. Also, their color is brown, but not black, because it hasn't been overly roasted. 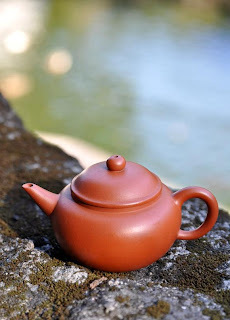 To brew these few old leaves, I'm using a top quality Shui Ping zhuni teapot (shown yesterday) made in the 1980s. 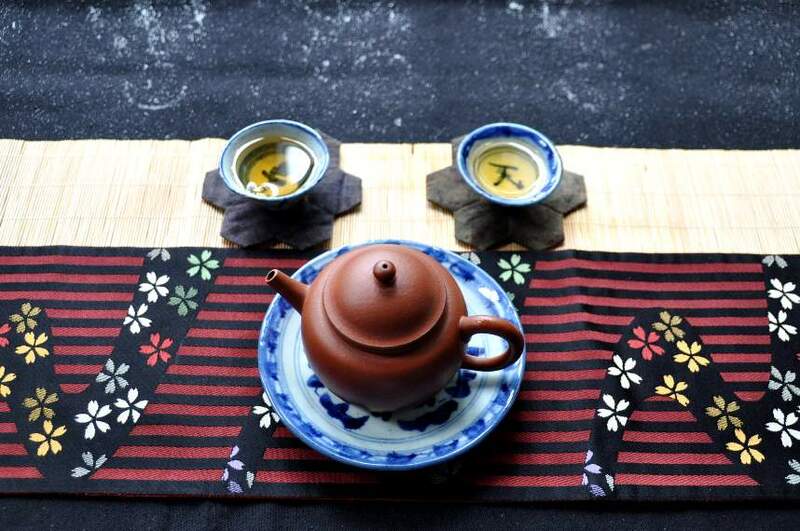 The zhuni clay gets the most out of rolled leaves, because its high iron content keeps the teapot hot very long. 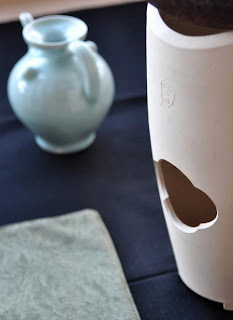 And its hard walls are less porous, which explains why they absorb less flavors than other clays. 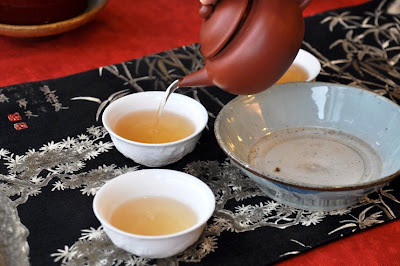 But the difference with silver (which is hotter and not porous at all) is that the clay interacts with the tea and refines, purifies it and adds a longer aftertaste. 1. 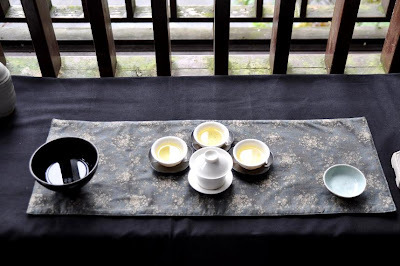 In spring 1980, this traditional Dong Ding Oolong was the best and most sought after tea in Taiwan. 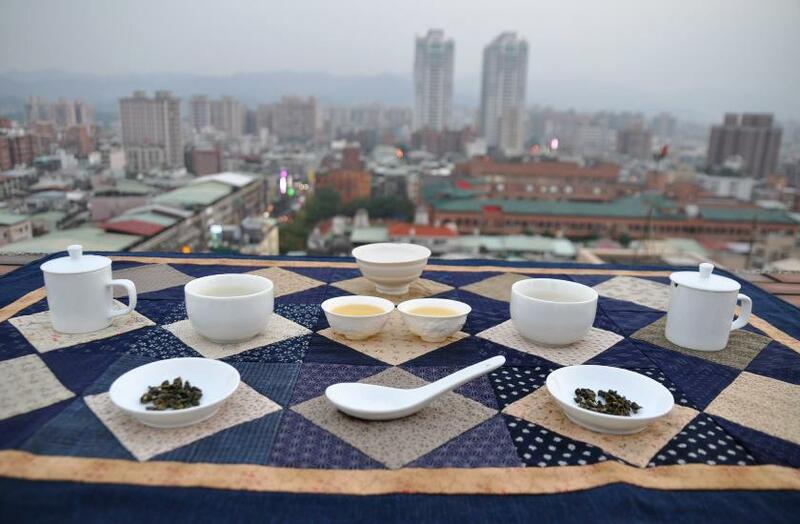 High mountain Oolongs had not appeared yet. Feng Huang, the highest elevation in the Dong Ding area, was at the top of its fame. In terms of purchasing power, the prices were similar to Da Yu Ling Oolong today! 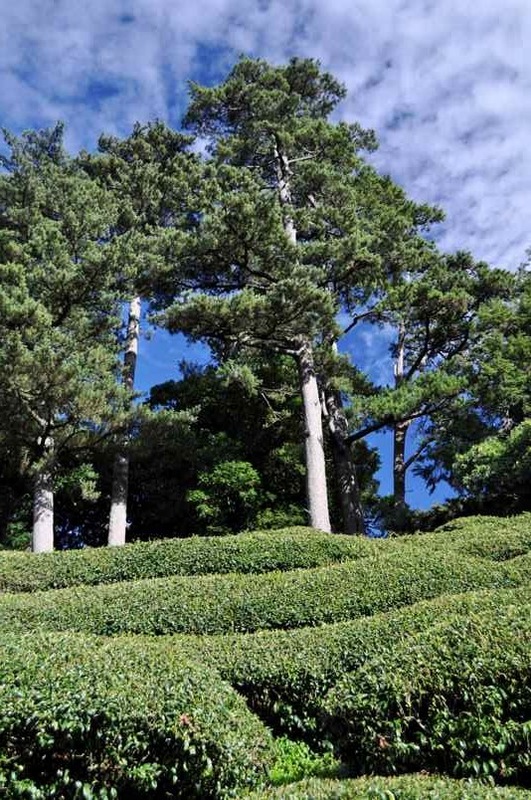 And that's why the best tea makers used all their skills to produce the very best tea possible. High standard. 2. Low to medium oxidation of the leaves and slow, long baking of the leaves were distinctive characteristics of these Dong Ding Oolongs. 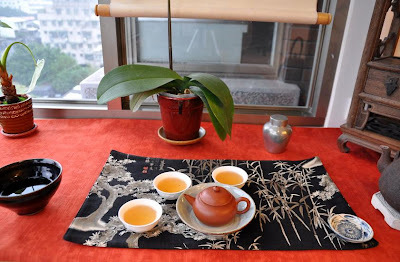 We also call them Hung Shui Oolongs, or red water oolongs. But, actually the color of the brew tends rather to be golden, with hints of brown. 3. In tea auctions in China, similar 30 years old Dong Ding Oolongs have reached the price of gold!!! At today's valuation of gold (1711 USD for 1 ounce), this translates into 60 USD per gram! Hence, this is the gold standard of Oolong tea! (I've noted before that this price level isn't unheard of: 80 years of puerh can cost 3 times as much or more). There is even a fourth reason to call it the 'gold standard'. This tea tastes unbelievably good. It's not sparkling like a diamond, but it's powerful and peaceful. The scents are complex and elegant, a mix of dark malt whiskey, old wood, chocolate and ripe fruits. The taste is luscious and thick, while completely clean, pure and sweet. 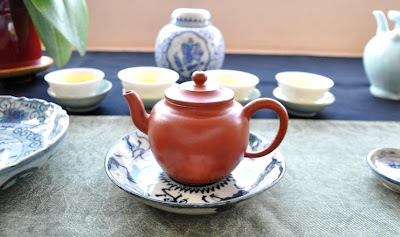 The first brews unleash a powerful cha qi that warms my whole body. At the same time, it feels very well balanced and after a couple of brews there are also more and more hints of freshness and 'green' feelings. This tea still very much feels alive and its aftertaste is continuously playing in the mouth. One cup calls for another. Here are some leaves, taken after 4 brews. I later put them back into the teapot to continue brewing this tea for 2 days! The more often I brew, the more the leaves open up and their color turns more and more towards green. The tea still feels very rich, sweet and soothing. As I smell again the dry leaves in their pewter tea caddy, I am reminded of the scent of Christmas cookies with some anise and ginger. This experience is like R&D for me. 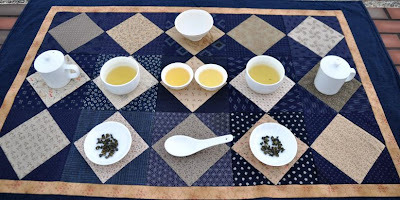 It helps me define what is top quality and what qualities to search for in young (and more affordable) teas. It's not something I drink often. It is much more a tea for special occasions. 1. Drinking a good tea to celebrate the victory of the candidate supported by the tea party! 2. 1980 is the year Ronald Reagan was elected! 3. 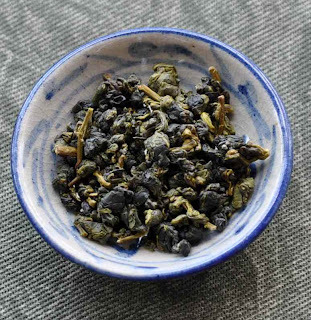 Mitt Romney appears less modern (high mountain oolong) and more the traditional kind (Dong Ding). 4. Only the 1% can afford this tea! 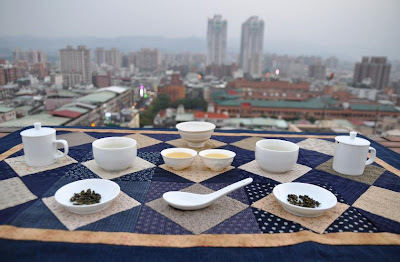 - A winter 2008 high mountain Da Yu Ling Oolong. This is a more modern tea, made when Obama won his first term. No matter what, this tea always keeps its cool. And Da Yu Ling farmers think very highly of their tea. However, it's not very affordable and it would not age well for 4 more years! 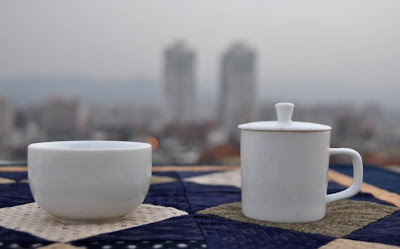 - A 1976 cooked brick (7638), one of the first black (shu) puerh as a symbol for the first black president. It won't change much over time. The next four year would be like the last four. This used to be an affordable tea, at least. Maybe we could borrow some from China, says the Fed! 1976 was also the year Jimmy Carter won... Oops! Disclaimer: I am French and can't vote in the US elections. All the above jokes were supposed to be moderately funny and were not aimed at changing the opinions of swing State voters! 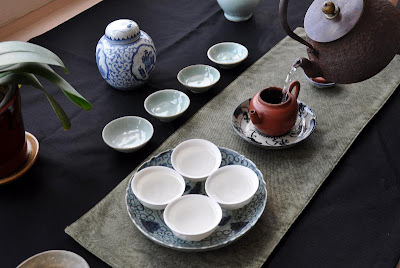 Pour bien commencer l'étude du thé, rien de tel qu'un gaiwan en porcelaine. C'est l'ustensile neutre, polyvalent et bon marché par excellence. 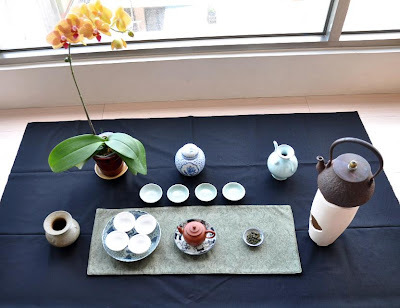 Puis, si l'on aime particulièrement les Oolongs, viendra le moment, un jour, d'essayer une théière d'Yixing pour voir ce que la glaise compacte et fine de cette localité de Chine apporte au thé. On remarque rapidement qu'il y a une variété pratiquement infinie dans ces théières. Formes multiples, glaises de couleur et porosités variées, tailles différentes, fabrication en série ou manuelle, température et méthode de cuisson... C'est un monde complexe où copier les classiques fait parti de la formation des potiers. 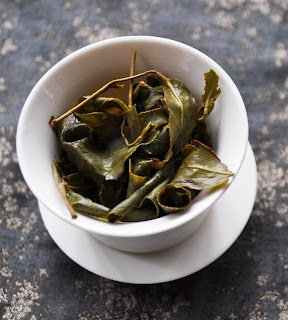 On en oublierait presque que la théière est avant tout au service du thé et a pour fonction d'extraire le meilleur des feuilles! Une de mes plus grandes joies de blogueur, c'est de partager mes connaissances et expériences. Et c'est aussi de vous envoyer les thés que j'adore boire, ainsi qu'une sélection d'accessoires. En terme de théières, vous aurez remarqué que je suis passé de l'utilisation de Xishi, Duo Qio et Da Bing Ruyi en zhuni moderne à des théières zhuni encore plus raffinées. Ces théières apportent un réel plus au meilleurs thés. 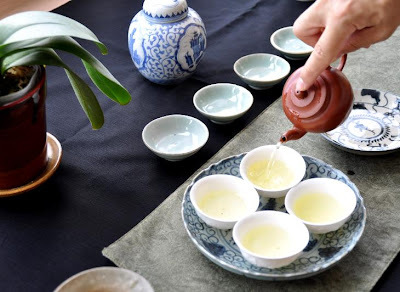 En effet, la glaise zhuni de très bonne qualité va magnifier les arômes du thé. 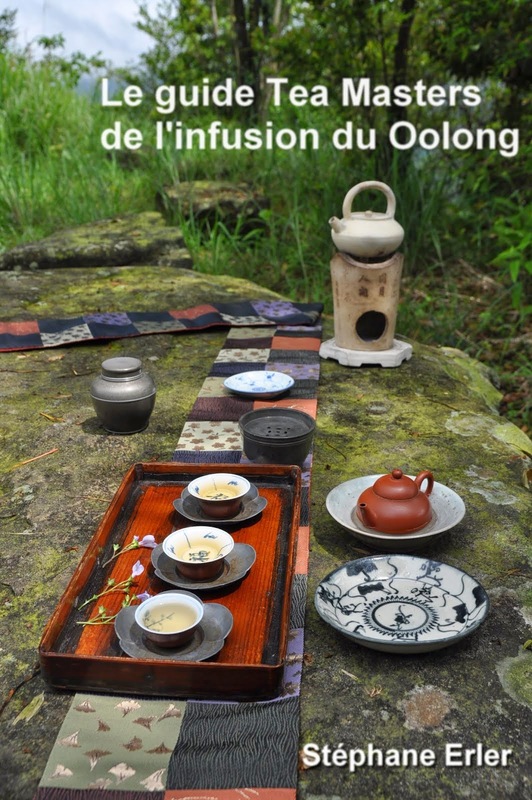 C'est surtout vrai avec de bons Oolongs moyennement ou pas torréfiés, les vieux thés, et les meilleurs puerhs. Actuellement, j'ai 2 telles théières en zhuni pour mon usage personnel (cette petite et cette moyenne). Pour l'instant, je peux vous proposer cette Shuiping que vous voyez dans cet article. Elle pèse 110 grammes pour 13 cl. Sa fine glaise est d'un zhuni plutôt clair et orangé similaire à ma zhuni moyenne. L'autre zhuni disponible est celle-là. Elle pèse 184 gr pour 19 cl. Ses parois sont plus épaisses et sa couleur rouge est plus foncée. Le prix de ces excellentes théières est naturellement bien supérieur aux théières faites en série. Il faut compter plus de 1000 Euros. Néanmoins, selon mon expérience, mieux vaut avoir une très bonne zhuni que 10 ou 20 théières moyennes. Mais la seule façon de le savoir est d'essayer la théière! C'est pourquoi, pour ces théières, je vous donne ma garantie de satisfaction ou remboursement! En effet, c'est une chose de voir des photos sur mon blog et de tenir et utiliser une théière en vrai. Et de tester le rendu de cette zhuni comparée à d'autres théières. Aussi, je vous propose de me renvoyer la théière et de vous rembourser si vous trouvez qu'elle ne vous convient pas. (Juste les frais de transport sont à votre charge). Undaunted by the rain, we found a covered spot to brew tea in the hills of Wenshan. 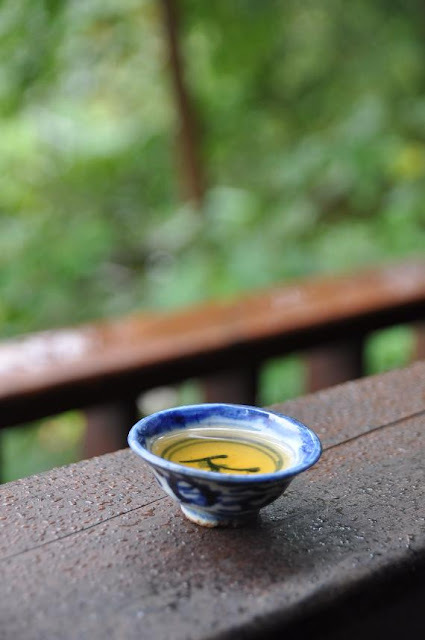 The cool and moist weather called for a roasted Oolong. 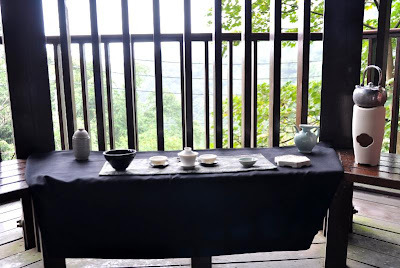 Also, since this was going to be the last tea of that outdoors session, I wanted to make it really special. 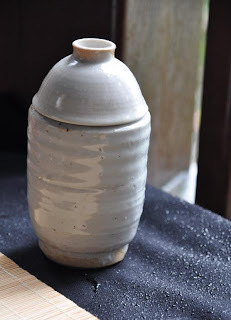 So, I took some leaves from this Anping jar. 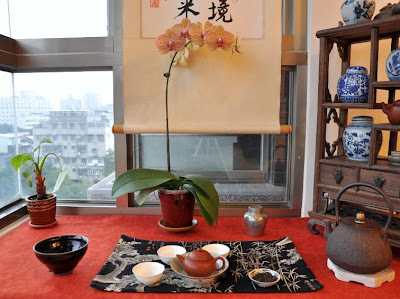 This is where I keep my 2011 spring Shui Xian Yan Cha... 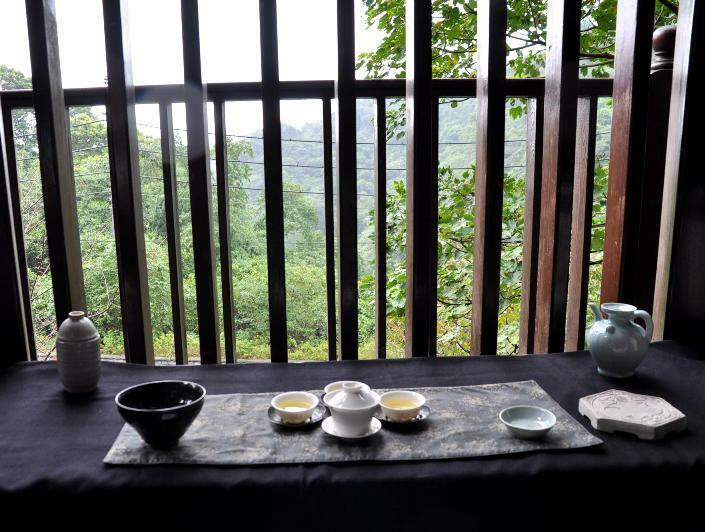 The thick, glazed walls protect the tea particularly well. This protection from the rain and wind was necessary that day! It feels like fall with this Chaxi. The water is boiling already. 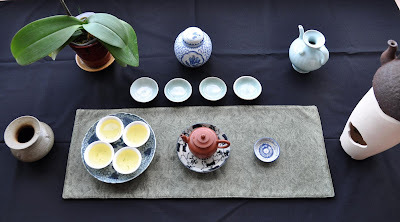 I make a last minute change: I replace the De Hua dragon cups with 2 old qinghua cups. This will give a more 'out of time' feel to this tea. 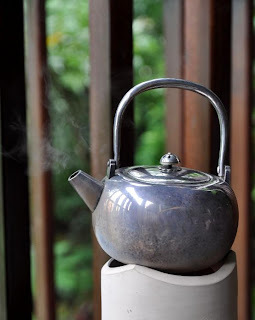 As a consequence, I need to adapt my brewing method to the tea and teapot. 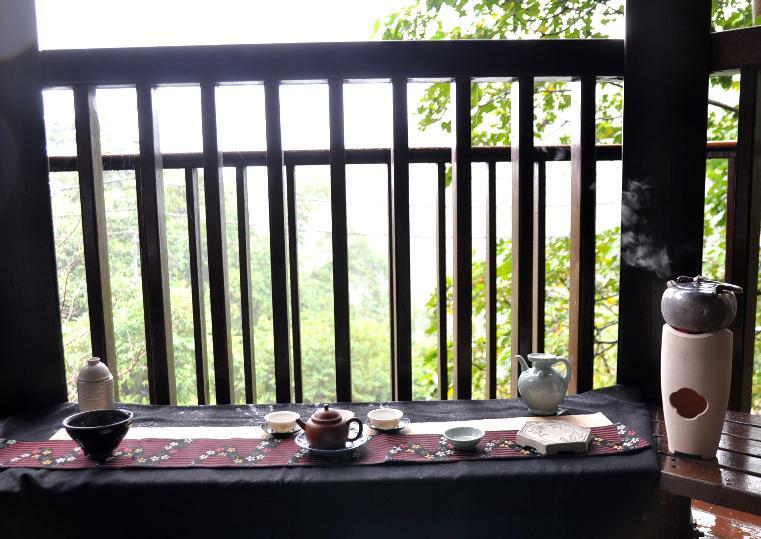 Ideally, you brew Shui Xian with lots of leaves in a very small teapot (and such a session can last for a very long time). But we didn't have that much time left, the teapot is rather big and I don't want to waste top quality leaves. So, as I mentioned above, I only used very few leaves. 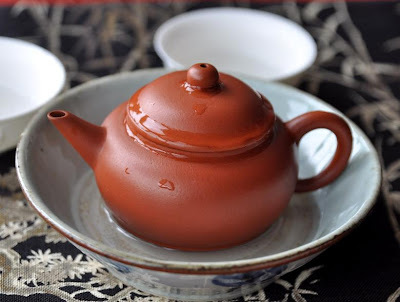 I preheated the teapot and the cup, barely covered the bottom with Shui Xian and filled to teapot roughly 80% with boiling water. 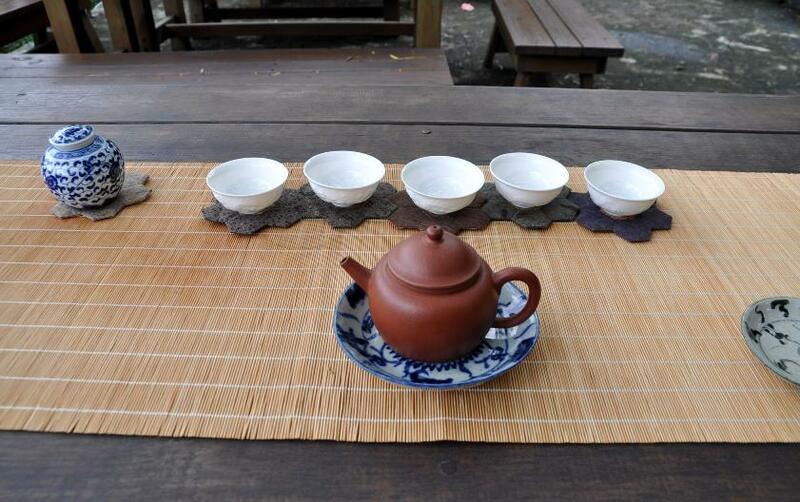 One characteristic of top grade leaves is that they can brew for a long time and the tea will still taste good. 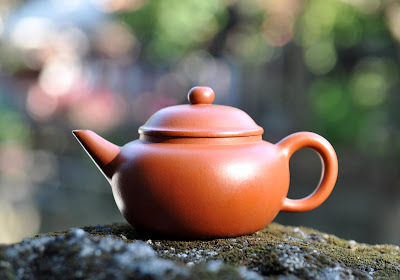 And when they are paired with a top grade zhuni teapot, the tea is really pushed to its limits, because this clay is particularly hot. Even for a light brew, the teapot is capable of expressing the personality of the tea. 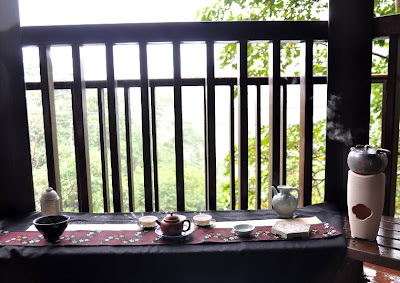 So, I poured a first light brew in the cups while the leaves continue to brew with the rest of the leaves inside the teapot. 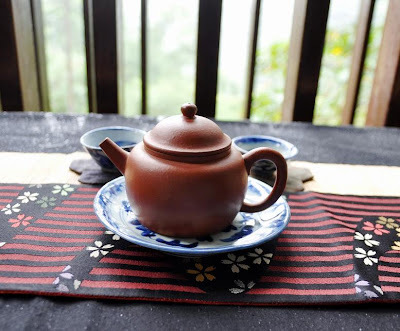 And even with this first cup, the 'mineral', rock feel of this Yan Cha is obvious. It also feels very smooth and natural. Each new brew becomes darker and more concentrated. But the clean, natural feeling of rocks only gets stronger. There are no bad tastes. On the contrary, the energy is getting more intense and soothing. The rain continued, but it didn't matter. 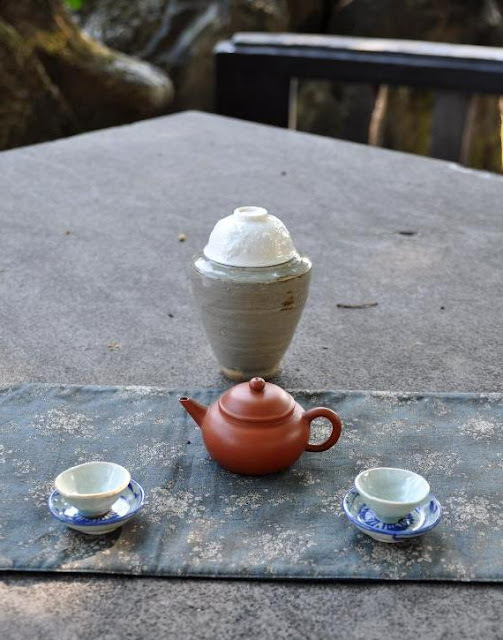 A small cup had brought pure tea joy. 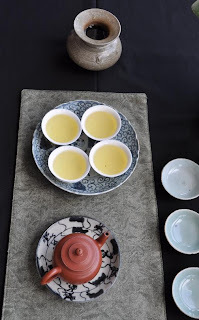 A joy worth sharing with a tea friend. La visite d'Anne-Marie, qui m'avait si gentiment assisté sur mon stand du TeaWorld Rendez-vous à Bruxelles, est l'occasion d'aller en montagne pour lui préparer du thé. Le mois d'octobre est idéal pour visiter Taiwan, car les températures sont tempérées, et il pleut rarement. Sauf ce jour-ci! Aussi, je choisis un endroit couvert pour nous protéger du crachin. Chauffée au charbon de bois, la bouilloire en argent ne tarde pas à frémir. 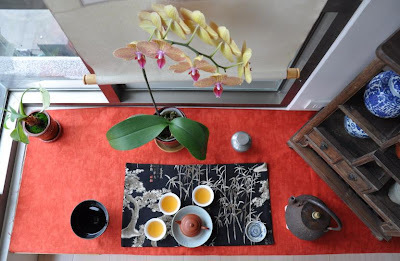 Entre-temps, j'ai arrangé mon Cha Xi pour une ambiance sereine et zen. Le zhong en porcelaine est neutre et nous permettra de juger la qualité de mon nouveau Ali Shan d'hiver 'fin' le plus objectivement possible. 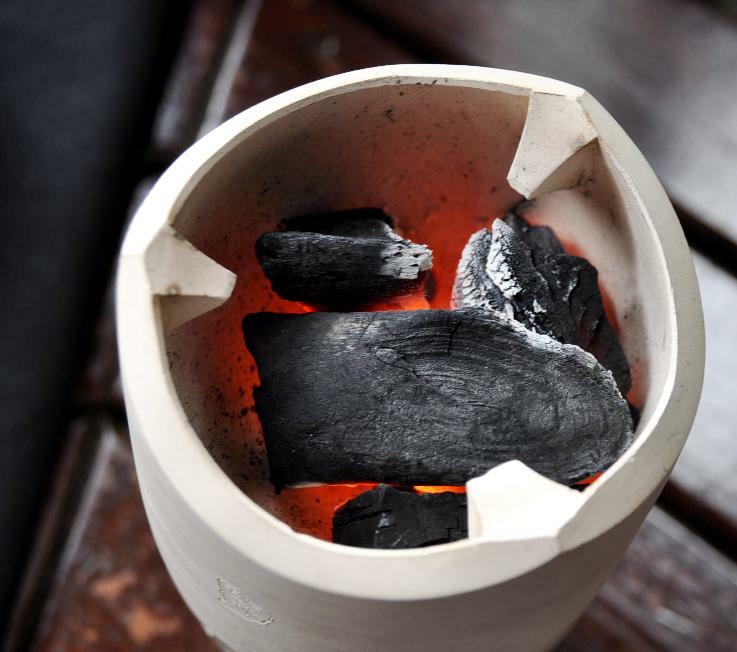 Une douce odeur de charbon brulé se répand et nous réchauffe. Les braises incandescentes dans le brazéro blanc se mêlent aux bruits du vent dans les feuilles et de la pluie fine. Le vent attise le feu et le feu chauffe l'eau dans la bouilloire. C'est l'association de tous les éléments! Préchauffage du gaiwan, puis des coupes. Une couche de feuilles au fond du gaiwan et l'infusion peut commencer! 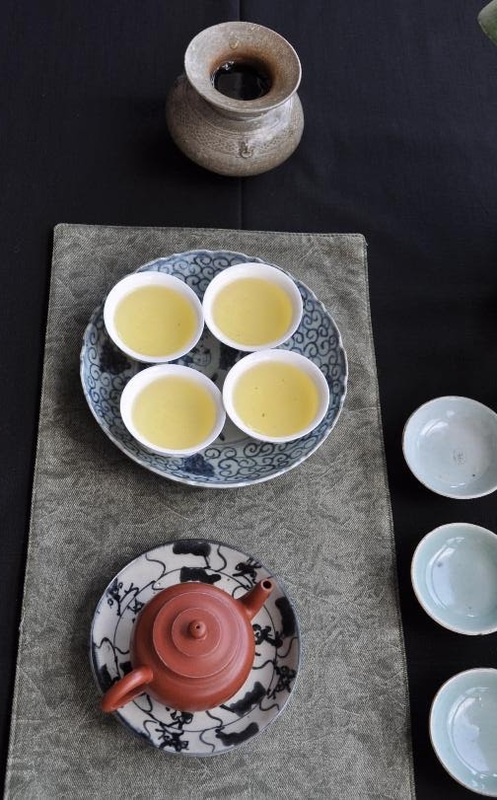 Une infusion dorée brille dans les coupes 'dragon' en porcelaine. 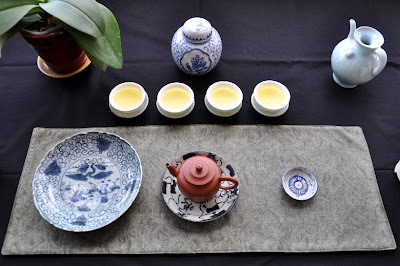 Pour Anne-Marie, la particularité du goût hivernal est de d'abord ressentir la douceur avant de ressentir la composante fraicheur de l'Oolong. Au printemps, c'est la fraicheur qui prime. 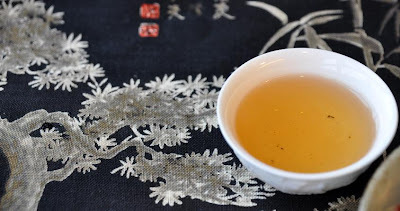 Aussi, pour cette journée fraiche, cet Oolong hivernal est plutôt chaleureux et énergisant. 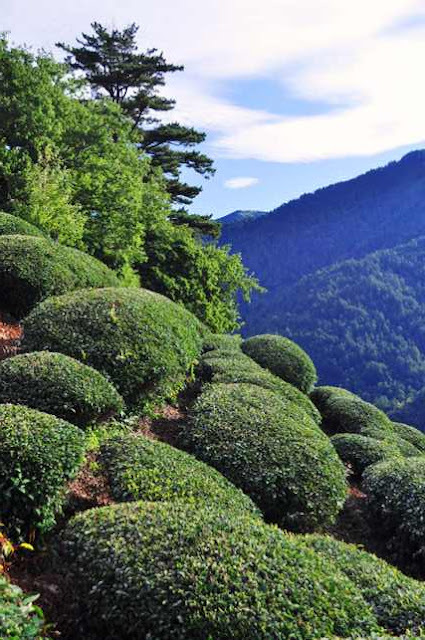 La force des hautes montagnes se retrouve dans ces feuilles épaisses et longues. Un excellent cru! De plus, son goût et ses odeurs 'agrumes' s'accordent bien avec un chocolat (au lait) à l'orange! 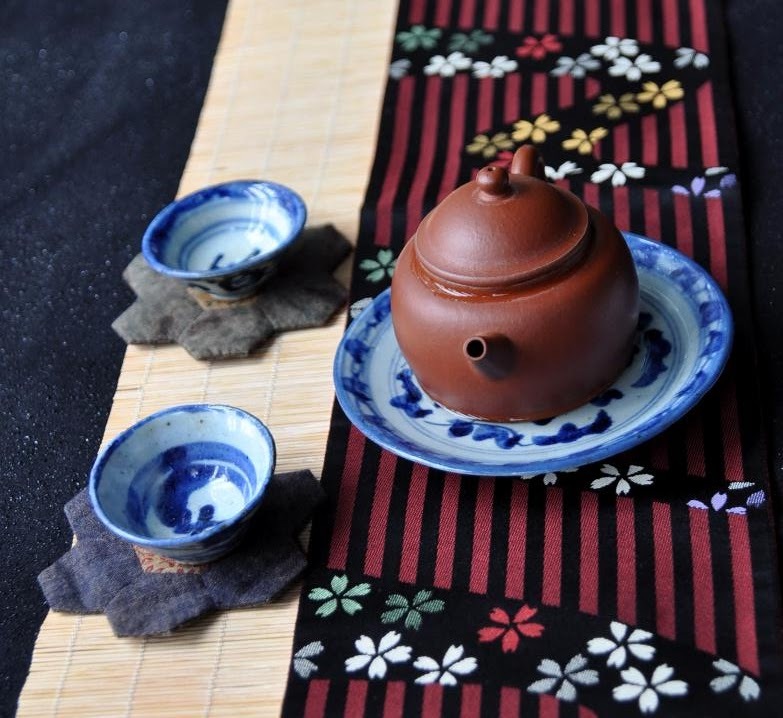 La longueur du thé prolonge le goût du chocolat, tandis que leurs odeurs respectives se combinent harmonieusement. Pour ceux qui font rimer thé et chocolat, voici un thé qui fondera bien le chocolat à l'orange dans la bouche! La meilleure méthode est de les consommer en même temps (au lieu d'un après l'autre). 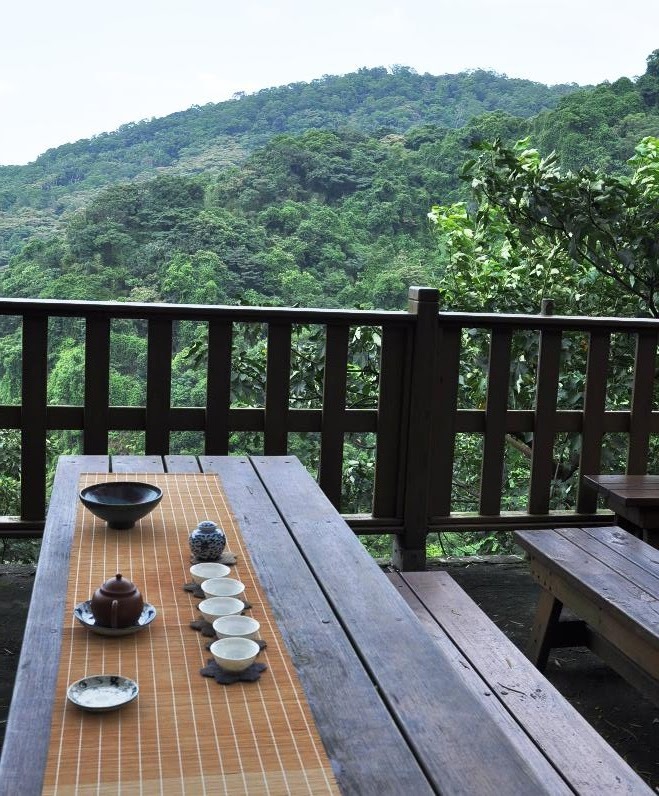 Alishan is one of the most popular tea mountain for a reason. 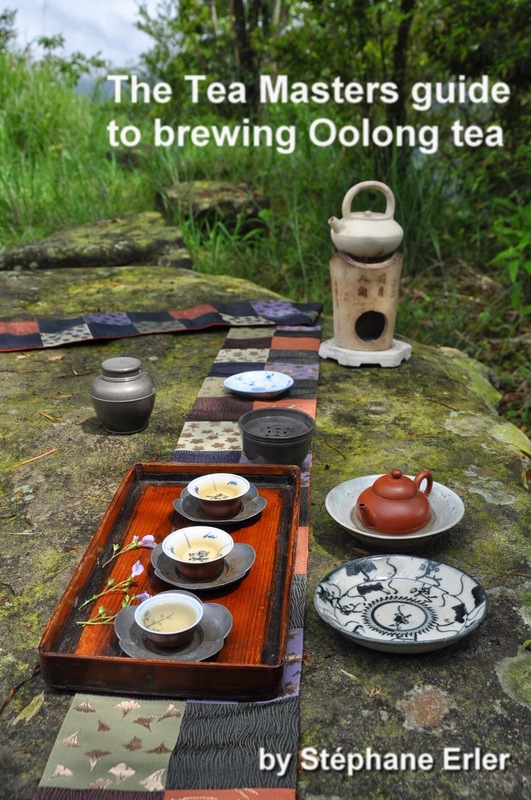 Its Oolongs have a lot of Gao Shan energy and vitality. At the same time, their prices are very reasonable when compared to Lishan or Da Yu Ling. This winter, I have selected 2 luanze Oolongs (qingxin Oolongs) from Chang Shu Hu in Ali Shan. Both were hand harvested from an elevation of 1500 m to 1600 m. Only 2 days separate them. The first (left) was harvested on September 30, 2012. The second (right) was harvested on October 2nd, 2012. 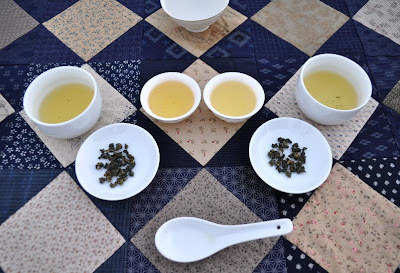 Tasting both Oolongs provides a good example of how Oolongs from the same season and same location can vary. You just never get exactly the same tea. 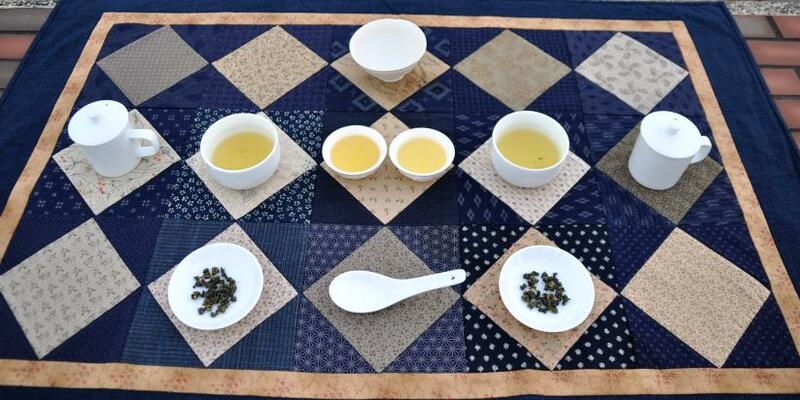 Each batch has its characteristics, and this makes selecting Oolong so interesting and important. Both dry leaves exude a dry lavender scent. It is stronger and darker on the left, lighter on the right. The brews have a fruity scent reminding me of ripe, sweet and juicy oranges (the kind you peel, not press). The right has again a stronger scent. Both Oolongs have a sugar cane sweetness that is characteristic of winter harvests. The right one is slightly astringent also, while the one on the left is smoother. Both leave a cooling sensation on the tongue. The aftertaste is very long and full of pleasant stimulations in the mouth. The left tea has a more rough and darker note compared to the tea on the right. Both brews are very clear and bright. The brew on the left is darker. We can see that the leaves are more oxidized (red edges) than the tea on the right. 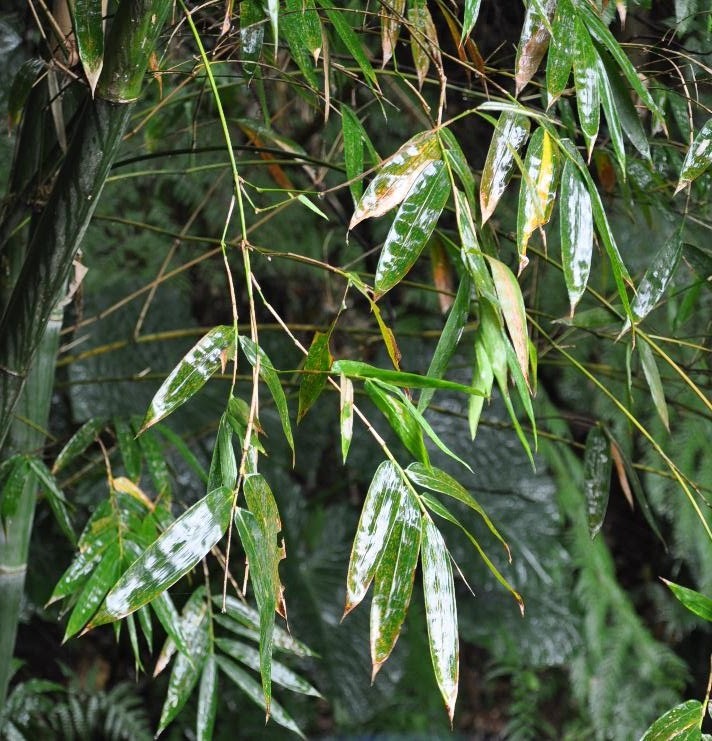 There the open leaves have a darker greenish appearance. 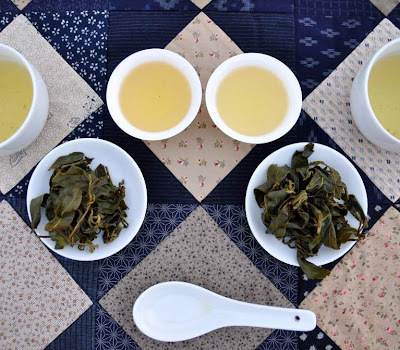 This is a tea that has seen more sunshine than the batch on the left. That's also why the right tea hasn't been dried as long as the left. 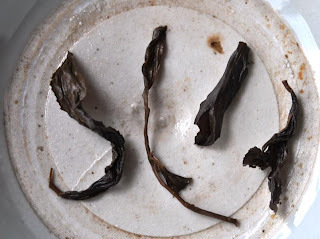 Conclusion: The Oolong from September 30 displays stronger 'fruity' notes. 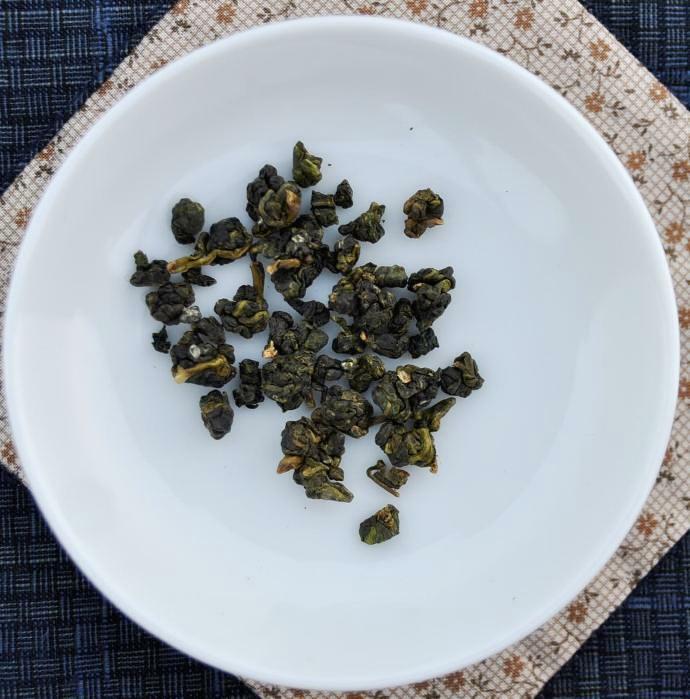 The October 2nd Oolong is lighter, but also finer. I will call them 'fruity' and 'fine' on my selection. Both are very pleasant and convey the warmth and fresh energy of Alishan Oolong! "Quand je danse, je danse ; quand je dors, je dors." Et quand je bois du thé, je bois du thé! Aurait-il pu ajouter! Avec le téléphone mobile et la tablette connectée en permanence à Internet, partout, les distractions abondent. Je remarque que j'ai du mal à ne pas consulter mes mails, les dernières nouvelles... avec cette nouvelle technologie. 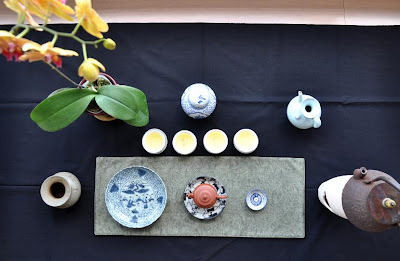 Je suis bien plus accroc à Internet qu'au thé! C'est en dégustant du thé que je remarque combien il est important de se concentrer sur une seule activité à la fois. Le plaisir diminue quand je fais moins attention aux détails, ou bien que je m'interromps. 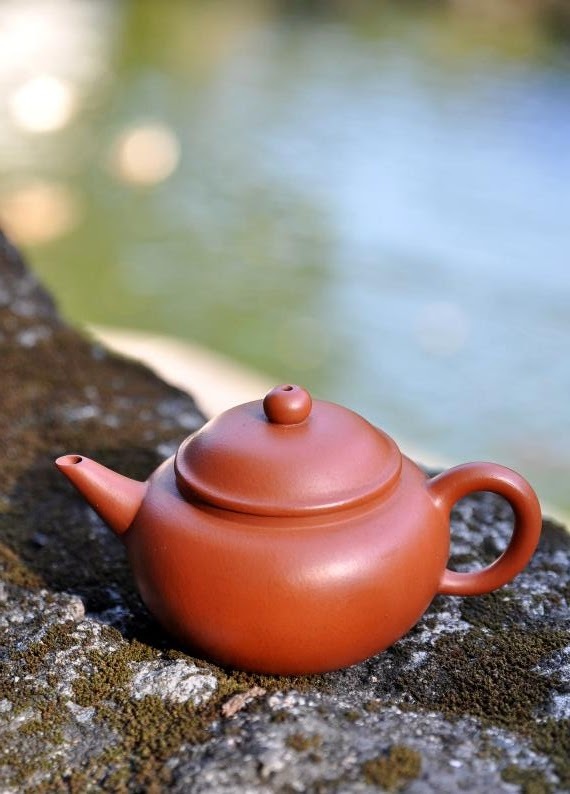 Boire plusieurs thés en même temps cause les mêmes problèmes. Je fais moins attention, et donc j'apprécie moins. De plus, les goûts et after tastes se mêlent et s'emmêlent. A la fin, j'ai du mal à bien les différencier. Je pensais gagner du temps avec ce multi tasking, mais finalement j'en perds, car ces dégustations sont trop superficielles et ne me donnent qu'une fraction du potentiel des feuilles. Le mieux pour profiter pleinement du thé, c'est d'y consacrer un Cha Xi. Unique et personnalisé, le thé reçoit l'attention qu'il mérite, et nous le rend bien! Due to the cold climate of high mountains, Da Yu Ling is harvested last in spring, but first in winter. And this year, the cold season has arrived even earlier than usual! 2 weeks ago, I tested it with porcelain (article in French). 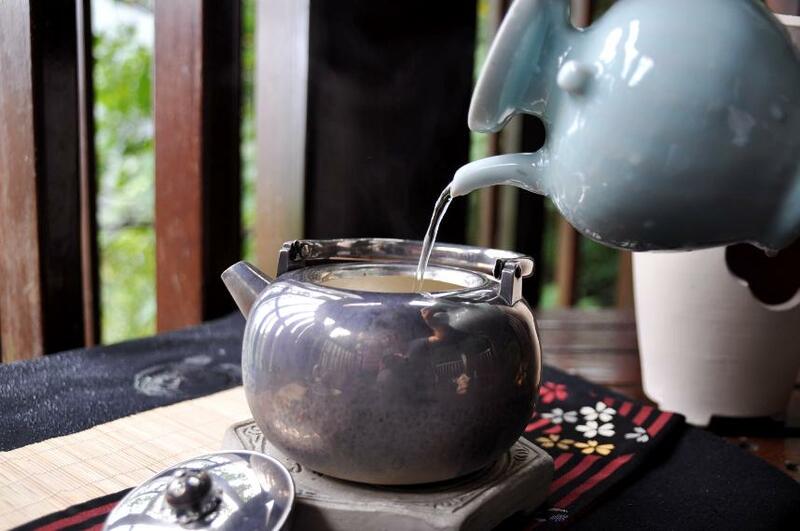 Today, I'm enjoying it in a zhuni teapot! Harvested by hand on September 14, 2012. Process: unroasted high mountain Oolong. 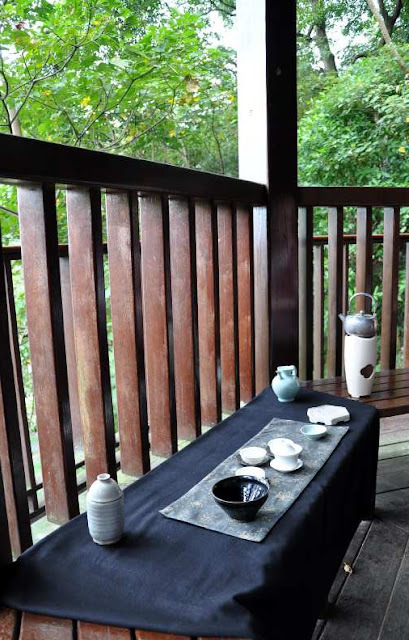 The fresh fragrances of the dry leaves have sweet grass and flowers notes. Alpine air! 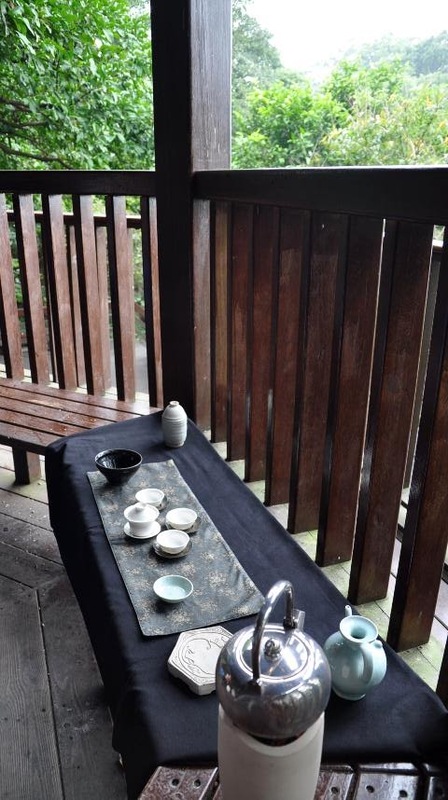 While the leaves are brewing, I empty the cups with both hands. One cup at a time. Slowly. Using two hands to hold one small cup may seem strange. One of the first things visitors to China and Taiwan learn is that it's polite to use both hands to give/receive a name card. Using only one hand is seen as too casual. When you use both hands, you are showing respect. What you hold seems more fragile and precious, but at the same time it also looks well protected. This avoids the stress of seeing someone handle teaware with little care and wondering if or when an accident will happen. As for your body, when you hold a cup with both hands, your reach is shortened, but you feel more balanced and centered. 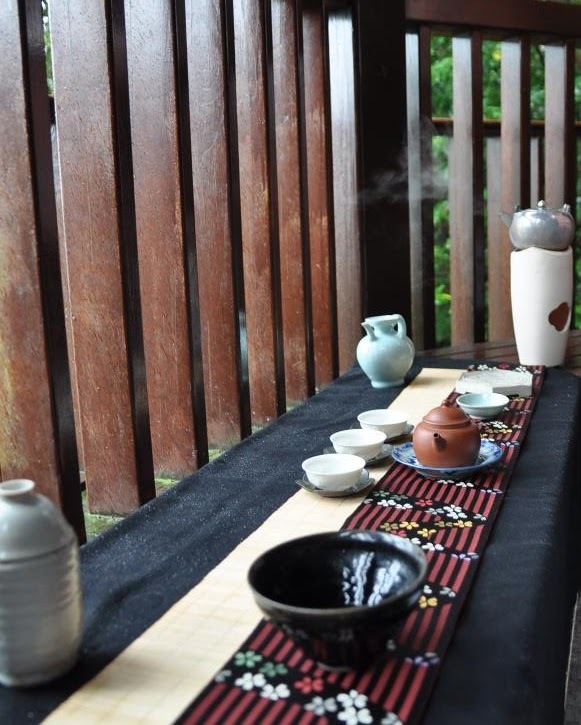 And the slow movements help the mind to calm down and focus on the tea experience. 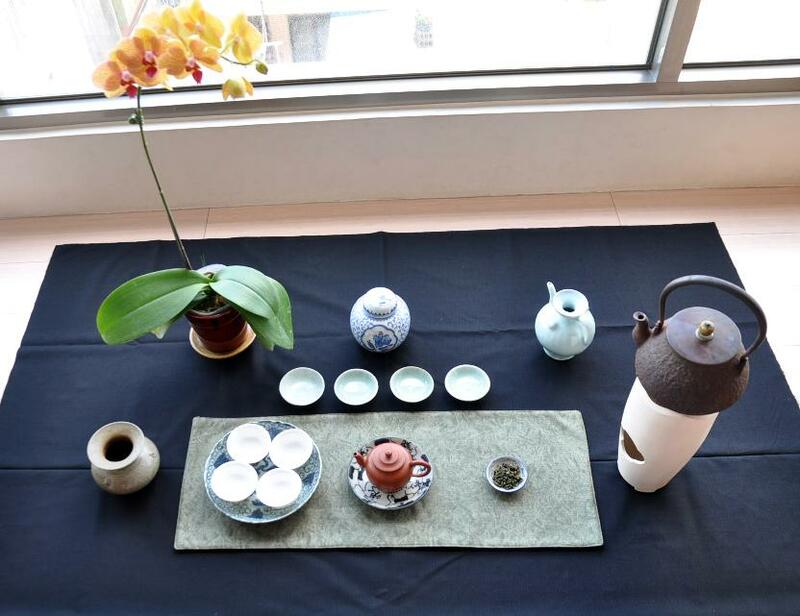 The brew of Da Yu Ling is particularly light. It has a yellow color with hints of green and is perfectly transparent. It is like the winter sun, shining its freshness in the dark days. 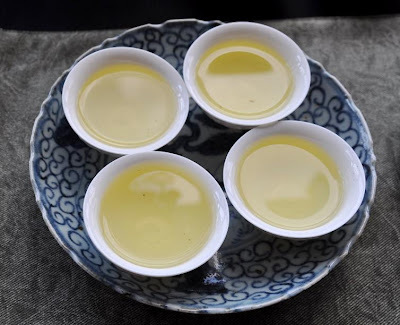 This is the feeling I try to convey with this Cha Xi: a dark winter, a big white cypress tree (the brazier) like in the high mountains, and then the freshness of green nature that shines thanks to the tea we brew. 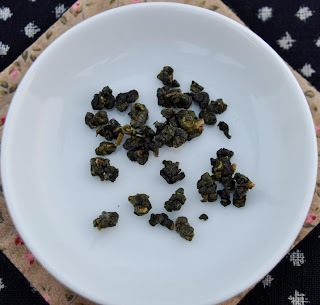 The taste of winter high mountain Oolong is particularly sweet. But Da Yu Ling's flowery fragrances also linger with intensity and finesse. What a joy! The Da Yu Ling Oolongs are a class of their own. 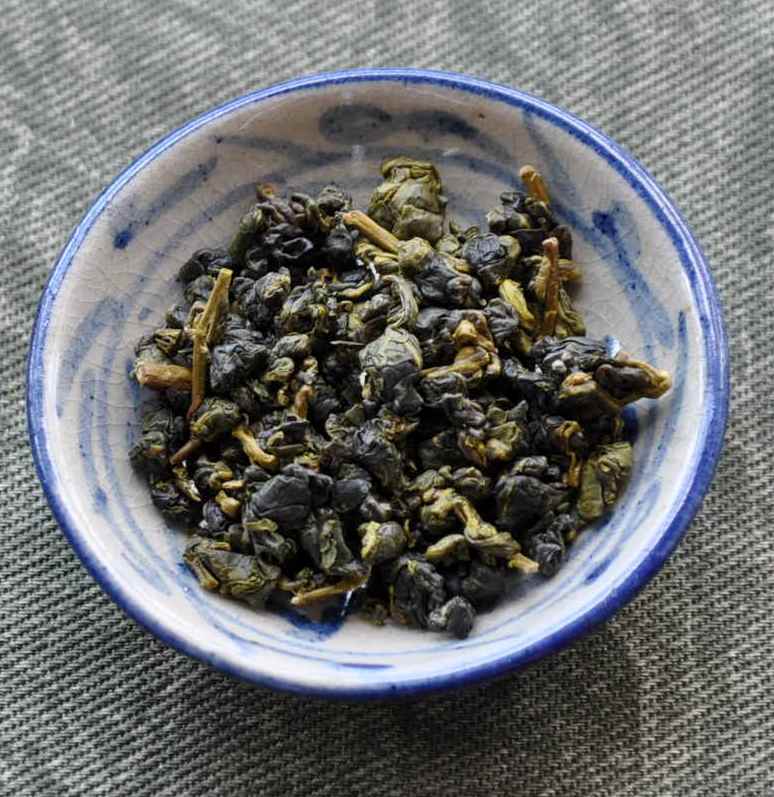 This batch is a very good example of the characteristics of this high tea mountain. 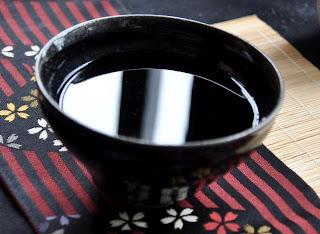 Its taste is so light, pure and harmonious, but at the same time it has so much power! The belly feels warm and this heat reaches hands and feet! The finish is long and evanescent. The delicate sweetness coats the mouth with a minty feeling on the tongue. The brews just turns slightly more yellow and the taste slightly stronger. But it's amazing how pure it still tastes. The open leaves open up very large and thick. It's hard to believe they could have been rolled so small in the first place! The buds show signs of having been eaten by some insect. 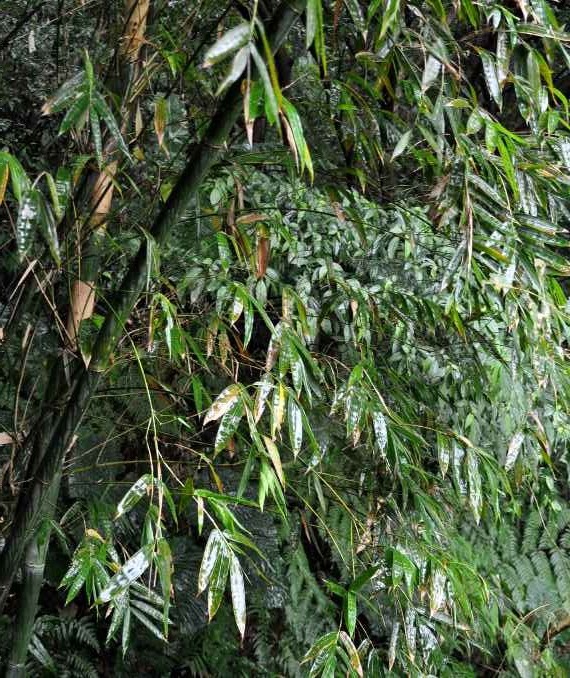 The leaves feel soft and strong. The aftertaste lingers on. It's a little bit like light static electricity in the mouth and on the tongue. It keeps on vibrating at a high pace. Or, you could also say that it's like very fine Champagne bubbles! 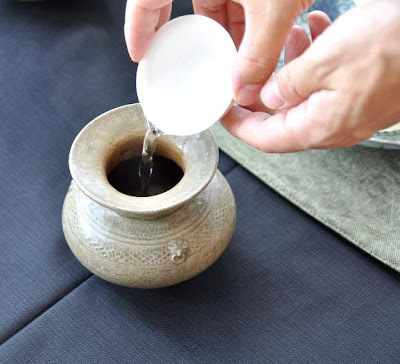 Combine this delicate electricity with recurring sweet aftertastes and a fresh, flowery fragrance and you have the Da Yu Ling Oolong experience brought by a top grade Yixing zhuni teapot.